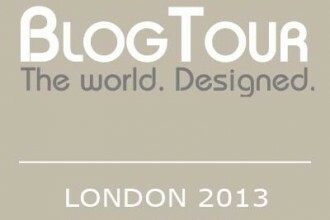 It seems as if BlogTour London lasted a mere blink of an eye during the London Design Festival in September. 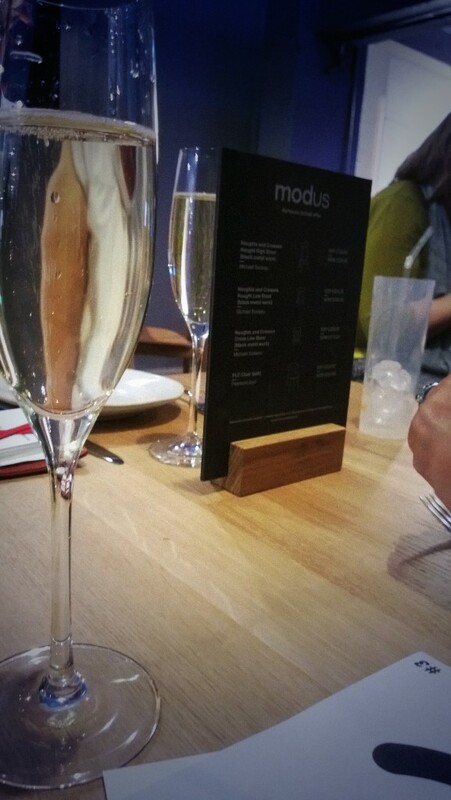 The days were packed with inspiring design, good eating and of course lots of bubbly, all of which swept by much too quickly. We want to recap BlogTour London from our point of view as a wonderful adventure from beginning to end and share our favorite moments in design, a great city and the people we’ve come to know and love. 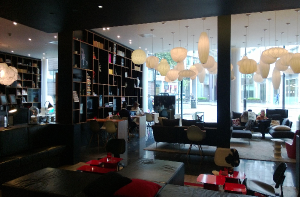 On arrival day, Blogtour London slowly trickled in to the Citizen M hotel in Southwark from all over the globe and right into the modern lap of luxury. Citizen M is a fabulous boutique hotel that accommodates the avid traveler with its state of the art technology, conference rooms and study nooks, furnished with computers, wi-fi and contemporary decor. The ambiance is casual with a centerpiece bar and ample lounge seating but we like to think that it is equally conducive to conduct business. 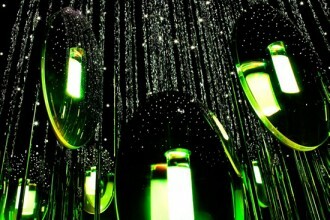 The rooms utilize every bit of space function dictating form in the most stylish way. Did we mention the bed spans the length of the room? 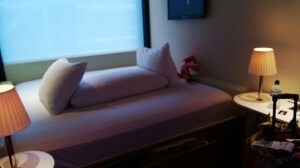 Essentially, that should be the most important part of any hotel room and Citizen M nailed it. 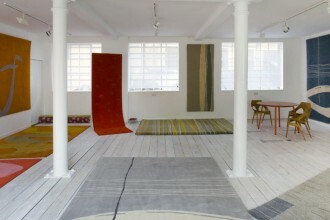 We kicked off Day 1 of BlogTour London with a visit to Design Junction. 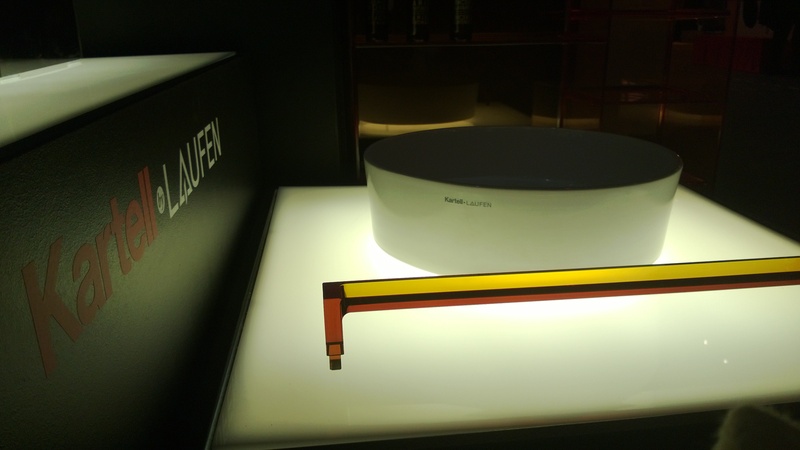 Our first stop throughout the show was to BlogTour sponsor Laufen, who were exhibiting their newest collection “Kartell by Laufen”. 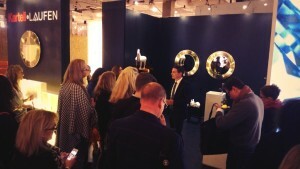 The bloggers absorbed information about the collaborative collection with orange, translucent plastic and innovative ceramics. 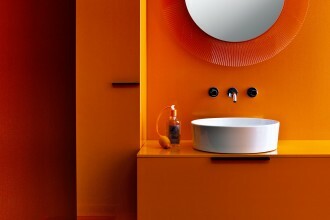 The Kartell by Laufen collection is simply stunning with its vibrant orange plastic accents and beautifully crafted ceramics. 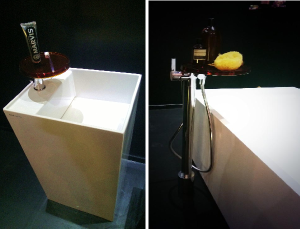 This sink made with the SaphirKeramik is classic and unique with its invisible drain. The drain is located on the bottom left corner, as a discreet opening just under the ledge. The plastic accessory adds a fun splash of color to the otherwise classic ceramic sink. 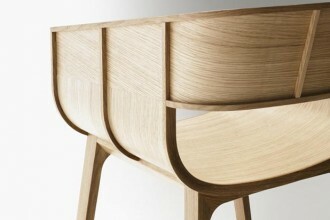 Kartell by Laufen is a line that integrates Italian creativity and the durable quality of Swiss ceramic products. 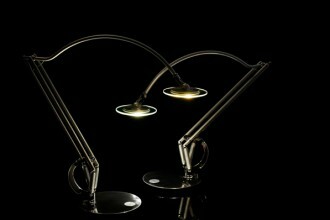 The rest of Design Junction was filled to the brim with unique British design, from bespoke lighting, to retractable bicycles. 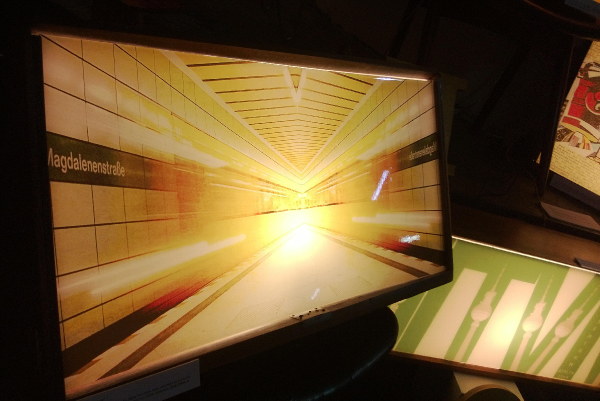 Running into Lilly’s Lightbox Company was certainly a treat with their collection of reused chests of drawers handmade by Felicia Strehmel. 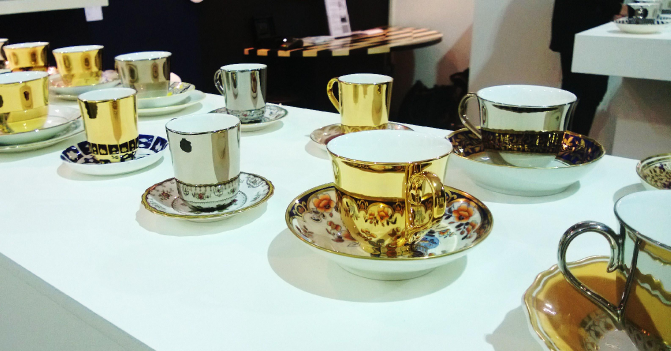 Another fabulous find was the teacup design by London designer Richard Brendon. We had the pleasure of speaking with Richard Brendon directly and getting the inside story of his bespoke collection. 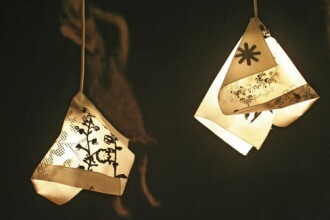 His passion lies in the history of the century old ceramics and their progression throughout time. 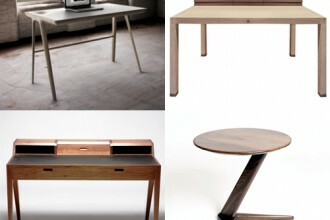 We absolutely loved this Reflect collection. The tea cups are are finished in polished platinum or gold reflect patterned saucers that had lost their cups over the years. Richard carefully selects pieces from antique dealers all over the UK. BlogTour London spent the rest of the day perusing the floors filled with mostly British design before settling in with the fine folks at Laufen who hosted our first dinner together at the Design Junction show. We were treated to plenty of bubbly, excellent barbeque from Jamie Oliver’s pop up restaurant Barcoa, and good conversation. First day a full success? Check!